Diana Artus’ black and white photographs of cityscapes and architectural facades have a spectral, haunting quality from the start. Yet her technique of creasing, folding, reproducing and adding dimension to her recent works intensifies this element, making the buildings protrude and furrow into uncanny forms. The title of Artus’ current exhibition ‘Avenida del Progreso’ (Avenue of Progress) – showing at Galerie Metro in Kreuzberg until July 20th – plays ironically on the decay of utopian industrial sites and, simultaneously, reflects her own process of production. As the viewer passes through the gallery’s central boulevard, they can experience the many layers and stages of her works’ development. One of the first pieces on display near the entrance, ‘Daydream Relic (Business District),’ is an intriguing faded photo in shades of pink and blue, that appears to have been printed on a scrap of paper towel. Artus explained that, in fact, in the process of mounting one of her photographs onto a metal frame with wheat paste, this piece had fallen off the back. The markings on the paper (that gave the impression of a patterned paper towel) are imprints from the metal backing, and the washed out colour is the reversed impression of the original photo. This error in the process gave the work an entirely new effect, unplanned by the artist herself. While the other works on display are, at times jarringly, different from this one and occasionally each other, the piece mentioned above can perhaps serve as a metaphor for the artist’s work more generally. While the photographs could stand alone in their excellent composition, she does not stop there: Artus’ body of work is decidedly process-based. The series of photo reliefs, entitled ‘Bump,’ attest to this most poignantly: the architectural subjects of her photographs undergo radical reconstructions in the course of her work. 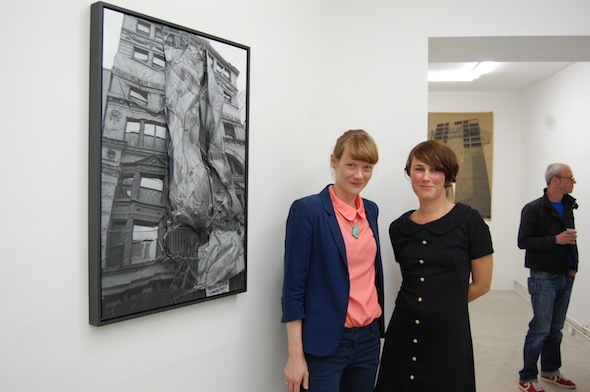 The gallerist Hannah Beck-Mannagetta (left) and the artist Diana Artus (right). Diana Artus studied at the Academy of Visual Arts in Leipzig. She has exhibited and worked in New York, Mexico City, Barcelona, Bilbao, Paris and Amsterdam. She is based in Berlin. Galerie Metro opened in April 2007 in Berlin-Mitte and has been located in Kreuzberg since 2010. Metro represents emerging artists – mainly working in the fields of video, photography, sculpture, and installation – with a conceptual approach, a high sensibility for material and an interest in the deconstruction of different artistic mediums. 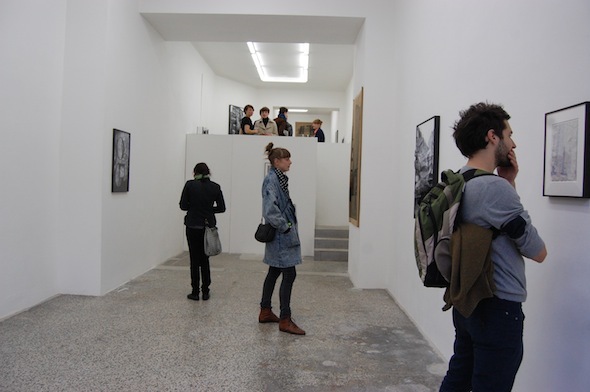 Galerie Metro will exhibit at Volta8 in Basel from June 11th-16th. Diana Artus’ works will be on display there, alongside those of Stephan Dill, Vanessa Henn, Ellen Lehmann, and Markus Leitsch.